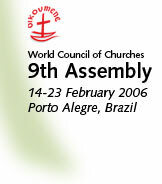 In a session held late on Thursday, 23 February, immediately after the closing of the 9th Assembly of the World Council of Churches (WCC) in Porto Alegre, Brazil, its newly-elected central committee chose its officers and members of the WCC executive committee. Rev. 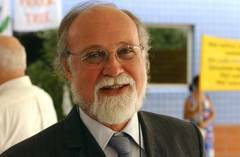 Dr Walter Altmann is the president of the Evangelical Church of the Lutheran Confession in Brazil (IECLB). He was the president of the Latin American Council of Churches from 1995-2001. From 1972-1974 he was a parish pastor in southern Brazil, and since 1974, has been teaching systematic theology at the Theological College in São Leopoldo. His theological work is focused on Martin Luther, Latin American liberation theology, and ecumenism. From 1981-1987, he headed the Theological College in São Leopoldo and was director of the Ecumenical Institute for Postgraduate Studies from 1989-1994. Metropolitan Dr Gennadios of Sassima (Limouris), of the Ecumenical Patriarchate of Constantinople (Turkey), is professor of theology in various universities. He was a vice-moderator of the WCC's Faith and Order Commission from 1998-2006. From 1983-93, he was a staff member of the WCC's Faith and Order secretariat in Geneva. He is involved in a number of bilateral dialogues involving the Orthodox, the Roman Catholic and the Lutheran churches among others. He has been a member of the WCC executive and central committees since 2002. He is the author/editor of numerous publications. Rev. Dr Margaretha Hendriks-Ririmasse is dean of the Theological Faculty of the Indonesian Christian University in Moluccas, and teaches Old Testament subjects. She serves as vice moderator of her church, the Protestant Church in the Moluccas. Hendriks-Ririmasse helped initiate an interfaith peace and reconciliation initiative in the conflict-ridden Moluccas region of Indonesia. She also served as one of four chairpersons of the Communion of Churches in Indonesia and was the vice-chairperson of the Association of the Theological Schools in Indonesia. The moderators of the programme and finance committees of the central committee, who are also members of the executive committee, will be elected at the first full meeting of the central committee in September 2006.